Last year around this time my local Ralph’s Market sent out a little brochure with a great appetizer recipe, Bacon Wrapped Dates with Choriso & Goat Cheese. 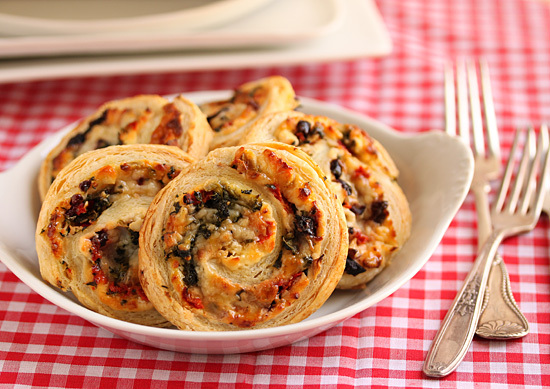 This year their brochure included these Cheesy Puff Pastry Pinwheels, which are stuffed with just about every ingredient that makes your tastebuds sing: artichokes, feta, kalamata olives, roasted red peppers and Gruyere. Plus spinach, so you can feel healthy. All rolled up in puff pastry, sliced and baked into really delicious pinwheel appetizers that can be eaten warm right out of the oven or at room temperature. It’s up to you. I think these would be wonderful to nibble on while watching the Superbowl next Sunday, February 3, being played in New Orleans. Since I live in Los Angeles, I’ll be rooting for the California team. Yea! San Francisco 49ers! Good luck to the Baltimore Ravens, too. I am looking forward to Alicia Keys singing the National Anthem, and Beyonce at Half Time. So about 3 PM I’ll be sitting in front of my TV watching those really fun commercials and thinking about all of you waiting in anticipation for the kick-off, just like me. 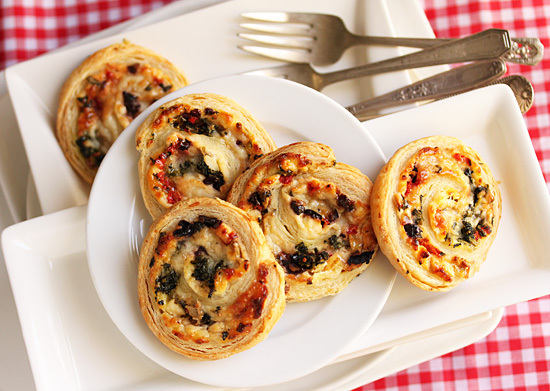 The chopped ingredients are rolled up in the puff pastry and sliced into 3/4-inch slices. The pieces fall out, but just stick them right back in and keep rolling. The slices may not be pretty and the little pieces are still falling out, but persevere, it all turns out ok in the end. Here are the finished Pinwheels cooling on their rack, looking so cheesy and delicious! 2. Arrange one sheet of pastry on a hard surface covered with parchment paper and roll with rolling pin to flatten. Keep other sheet of puff pastry in fridge. 3. Spread rolled sheet with half of cream cheese. Spread all the way to side edges and to the edge nearest to you. 4. Sprinkle with half the feta, half the olives, half the artichokes, half the spinach, half the red peppers and half the Gruyere. Sprinkle with ¼ teaspoon each salt, black pepper and garlic powder. 6. Seam side down, cut the roll into ¾-inch slices. Turn roll after a few slices so it remains as round as possible. Arrange slices 1 inch apart in a single layer on parchment paper-lined baking sheet. 7. 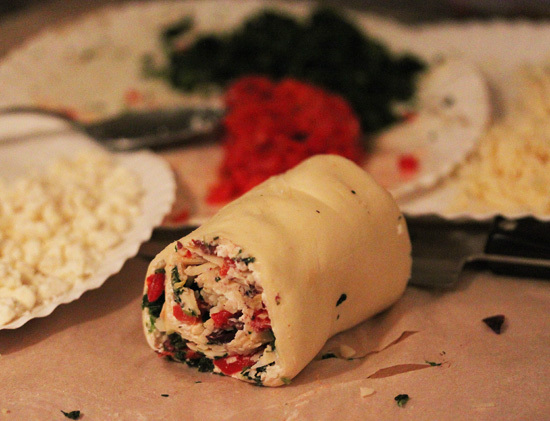 If not all of roll’s slices will fit on baking sheet, wrap remaining roll in plastic wrap and refrigerate. Use for second sheet. 8. Bake slices for 19 or more minutes, or until golden brown and interior puff pastry is cooked through. The melted cheese on the bottom may be dark brown, but that is ok. It tastes great. 9. Repeat process with remaining pastry and ingredients. 10. Serve warm from the oven or at room temperature. Refrigerate any leftovers between layers of parchment in covered container. Note: Do not microwave refrigerated Pinwheels to reheat. Let stand at room temperature. 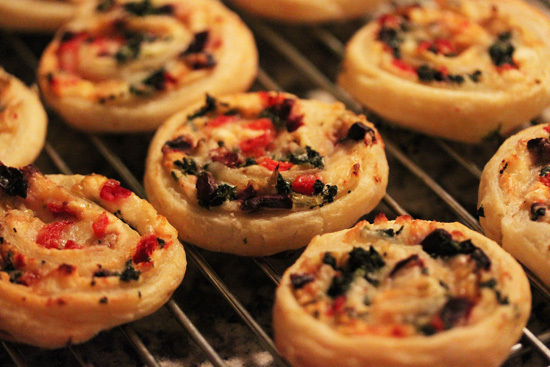 I need to make these sometime–they seems so classy but also so delicious and easy to make! Wow, so beautiful, and my favorite combo of savory ingredients! 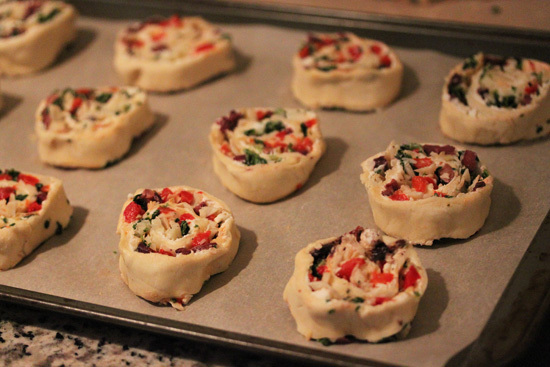 Plus, I like the mouthful you get when you say the title really fast: Three Cheese Stuffed Puff Pastry Pinwheels. I just hope my mouth isn’t too tired to chew them now. These look seriously good. New appetizer file. Thanks Lynne! These look like great appetizers! Might have to try these for the game this weekend.